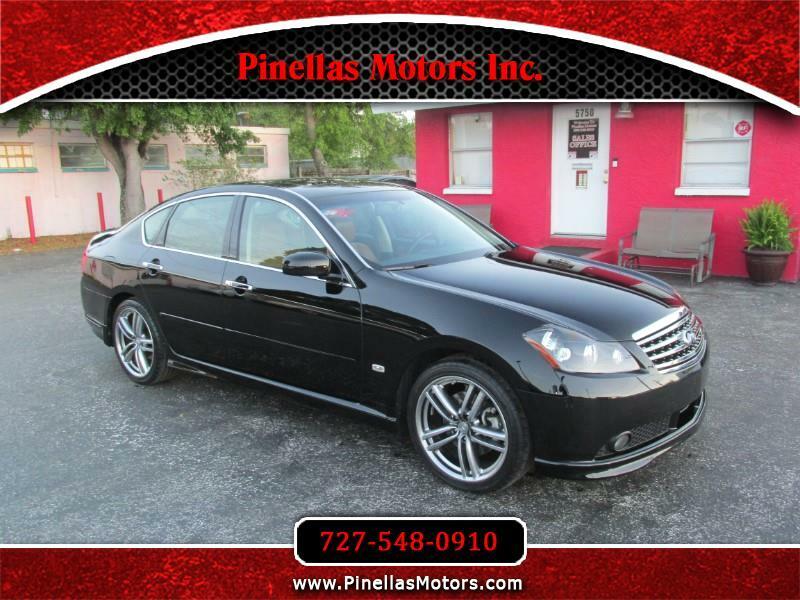 Used 2007 Infiniti M 35 Sport for Sale in Pinellas Park FL 33781 Pinellas Motors Inc.
PRISTINE CONDITION - LOW MILES 41K ORIGINAL - BLACK W/ SADDLE LEATHER - SPORT & AERO PACKAGE - This ultra rare 2007 Infiniti M35 Sport with Aero Package comes fully loaded with Navigation, Back up Camera, Sunroof, Heated and Cooled Seats, new tires, and the highly coveted Saddle/Tan interior! The vehicle has 41k original miles and was *babied* by the previous owner. Always garage kept and immaculately maintained. Mobil 1 synthetic oil and filter changes only. Transmission fluid flushed, rear differential oil changed, new Laser Iridium NGK spark plugs, and drilled and slotted rotors plus top of the line brake pads all done at 37k miles. It also has brand new tires with less than 300 miles on them. The interior and exterior of the vehicle is in immaculate condition...this is one of the rarest vehicles on the road and an absolute MUST SEE TO BELIEVE! Please ask to speak with the sales manager for intimate details on the vehicle. It was his personal weekend vehicle for 5 years. This vehicle has a Florida rebuilt title. Vehicle was in a rear end accident in 2014 and all repairs were completed and overseen by the sales manager at that time.